Get ready for a fun-packed hour of entertainment and education for the whole family – the legendary Agrodome Farm Show! You’ll hear amazing facts and have a few laughs as you’re introduced to 19 breeds of sheep. 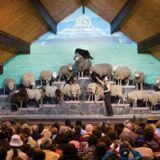 Then, witness a live sheep shearing demonstration and a fun sheep auction with bidding from the floor and audience participation. But the animal stars are not just sheep. The remarkable farm dogs will amaze you, as they demonstrate their ability to respond to commands and keep those sheep (and ducks!) in line! If a hands-on experience is what you want, jump up on stage for the opportunity to feed the baby lambs or even hand-milk a cow!